Businesses are increasingly turning toward unified communications (UC) solutions in order to increase their productivity and efficiency while padding their bottom line. In fact, anywhere between one-third and three-fifths of companies have already implemented UC solutions, and those adoption rates are extremely likely to inch up even further. For example, recent research indicates that the UC market will explode to $61.9 billion by 2018, up from $22.8 billion in 2011. While many businesses that have integrated UC solutions into their communications infrastructure have received numerous benefits on a company-wide level, the fact remains that these days companies are increasingly developing symbiotic relationships and collaborating with one another with impressive frequency. In fact, recent research conducted by the Aberdeen Group indicates that 83 percent of industry leaders have business-to-business (B2B) collaboration initiatives in place. So if businesses are realizing the substantial benefits UC technology has within their own companies—and are continually collaborating with one another—why should they not be able to realize the benefits of UC tools with their partners as well? 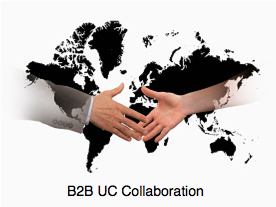 Because with so many UC solutions on the market, compatibility becomes an issue. Because the solutions have the ability to dramatically increase efficiencies—recent research indicates that employees who leverage such technology stand to save up to 115 minutes at work each day—one could imagine how such efficiencies would rise even more if different unified communications platforms were compatible across companies. With this in mind, forward-thinking business organizations are already giving their employees the collaboration tools necessary to compress decision-making cycles when dealing with external organizations—thus improving productivity and gaining competitive advantage.